I don't know about you, but I'm always looking for new content to watch. As an avid Netflix lover, I am guilty of binge-watching all of the content for a TV show all at once. However, once I finish it, I feel empty. What am I supposed to watch? 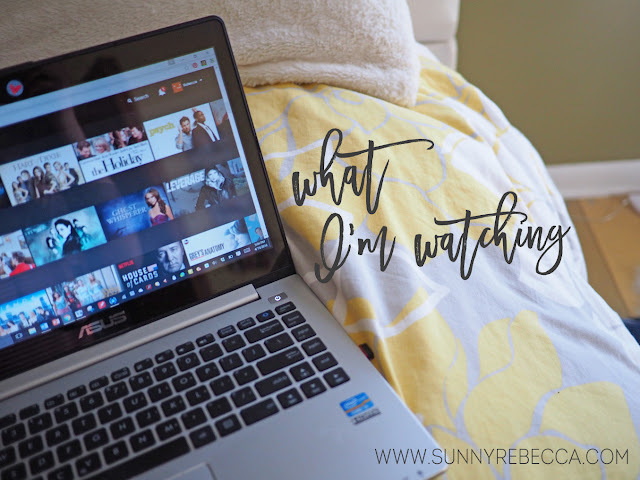 I'm sure that you feel this same way at times, so I've compiled a list of things that I've been watching (or watched) on Netflix, both TV shows and movies, that I enjoyed. I hope that this guide helps you out, but if you're still eager to see more, check out my previous post on What I've Been Watching, here. About: Once Upon a Time is based on fairy tales and Disney stories, but with a twist. Set in a little town called, Storybrooke, Maine, in modern-day life, the story follows protagonist, Emma Swan as she protects the town from curses and villains. Although the main characters are Snow White, the Evil Queen, Regina, Prince Charming, and Rumpelstiltskin, it still covers a plethora of tales that we know and love, from the story of the Wicked Witch of the West, to Frozen, to Peter Pan. With twist after twist of the stories that we know and love, Once Upon a Time brings new light to the characters that we already thought we understood. Personal Opinion: I think that this concept is so cute. I love a good twist on a classic and Once Upon a Time is all that. Personally, I think that the show really picked up around the end of season 3, I had been watching it for a while, but I didn't get truly hooked until that time. About: Catherine (Cat) Chandler first witnessed her mother's murder and escaped from her mother's killers thanks to the help of someone, something that she called "a beast", saved her. She had never known what it was and for the most part dismissed it as shock. But nine years later, she is now a detective and comes across a case regarding an ex-soldier that was supposedly killed in service. However, through the case, she finds out that he is alive and is involved in that night, helping to save her. She soon learns his secrets about who he really is and why he has to hide while also uncovering more about her mother's murder. Personal Opinion: I think that this modern day depiction of Beauty and the Beast is so fascinating. We always think of Beauty and the Beast as based on the infatuation of "bad boys", but in this show, the "beast", is not depicted very differently. It's full of action and suspense and let me tell you, I was on the edge of my seat. About: The story phases in-between the past and the present, focusing on present day crisis of a terrorist attack on Grand Central Terminal. The prime suspect, Alex Parrish, is innocent of the crime. She has no idea who did it, but she knows that it was someone that attended the FBI academy at Quantico with her and had been planning to frame her since the moment that they arrived at the academy. Centering around her time at Quantico, the audience gets to see the drama between her and her fellow trainees, while trying to guess who could have framed her and seeing present-day Alex rush to try and stop the terrorist from striking again. Personal Opinion: Quantico was recommended to me by a friend. She loves Priyanka Chopra and had previously been a fan of her Bollywood movies. When she recommended it to me, I was interested to check it out and I was not disappointed. The story had me totally hooked. Although I never guessed the terrorist correctly, it always had me on my feet, with twists and turns, both in the flashbacks and in the present-day story. About: Based off of the animated movie, Finding Nemo, Finding Dory covers the story of Dory, a fish, who has short-term memory loss. She was separated from her family at a young age, but due to her memory loss, she couldn't remember them and couldn't find them. Now, after many years, she has a flashback about them and is determined to find them. She, with her friends, Marlin and Nemo, swim to California on a search for her family, meeting new friends and exploring new places. Personal Opinion: As someone who enjoyed Finding Nemo in the past, I was excited about Finding Dory. However, I liked it so much more than I expected to. It was so cute, funny, and adorable, but I would be lying if I said that I didn't shed a few tears while watching it. My favorite characters are Bailey and Destiny - they're so cute! About: A romantic, comedy-drama, No Tomorrow focuses around the life of Evie Covington, who lives in Seattle and works a boring life in management at a Seattle shipping warehouse. She meets an eccentric man, Xavier Holliday, who at first is just a pretty face, but Evie soon gets to know him. He believes that the world will end in 8 months due to the collision of an asteroid with earth. Because of this, he plans to live life cherishing every day, checking off something from his bucket list, which he calls an "apocalyst". Although Evie is reluctant at first, she soon joins him on his adventures, as they seize the day and check things off the "apocalyst". Personal Opinion: I thought that this show was pretty interesting, I binged it in a few days. I don't think that I was necessarily hooked, but it was still enjoyable. It is unfortunately only one season, but I think that it's still worth watching. It's not really something that I'm on the edge of my seat on, but it's something that I feel that I enjoy and can relax while watching. I love recommendations from others on what to watch, so if you have any, I would love to hear them as well. We can help each other out! Let me know on Twitter or leave a comment below with your favorite movies and/or shows, regardless of if they're on Netflix or not.